Donnybrooke races this Chevrolet power special road racer from coast to coast, north to south. The racecar was reputedly built by Peter Ryan, a Montreal Olympic skier, as his entry into the big leagues of professional racing. 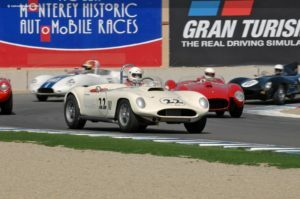 Ryan competed with the likes of Roger Penske, Sterling Moss, Maston Gregory, and Dan Gurney in the professional sports car races of the day. This Devin Special was Ryan’s first big time race car that lead to an impressive racing career. It was built in 1957 on a custom chassis using Jaguar Mark 9 suspension components, differential, and disk brakes . It had one of the earliest 4-barrel Holly carburetors sourced off of a 1957 Lincoln. The engine is a Savannah Engineering wet sump, small block Chevrolet, of 331 cubic inches. The transmission is a standard Chevrolet BorgWarner Super T-10 4-speed as supplied in Corvettes. This Devin Ryan Special carries Canadian colors as representing Ryan’s adopted country. 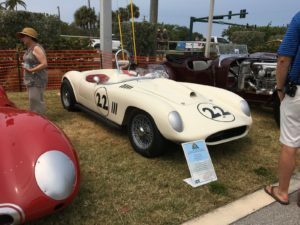 It competed in the 1957-1961 Sports Racer class with Ferrari Testa Rossas, Scarabs, Listers, Maseratis, Aston Martins and other specials of the day in a most competitive manner. Number 22’s next race with the Donnybrooke Motor Sports Team, under the direction of Richard Bezotte, will be at Barber Motor Sports Park in Birmingham, Alabama in mid-May.